The products reviewed are vegan, cruelty-free, and organic! The Orange Blossom and Sunflower Nourishing Cleanser contains Aloe Vera, Sunflower Seed Extract, Hyaluronic Acid, Avocado Oil, Orange Blossom Fruit Extract, Black Currant Seed Oil, and Red Raspberry Seed Oil. With ingredients like that, you know the product is going to be good, and I loved using it! It’s sweet and bright citrus fragrance instantly lifted my mood as it removed all traces of my foundation, concealer, eyeliner, mascara, and brow pencil! After using this, my skin felt clean and healthy, not overly dry or tight in any way. 1 pump was more than enough product to remove my full face of makeup, so the bottle will last for quite some time. It is definitely a new member of my daily skincare routine! The Dew Extreme Moisture Infusion Serum contains many natural and lovely ingredients, including Aloe Vera, Blue Passion Flower, and Mannentake and Shiitake Mushroom extracts. This serum has a fresh fruity and floral fragrance (say that 3 times fast!) that instantly wakes up your senses and brings your skin to life! Like the name implies, it gives your skin a shot of moisture, which my dry skin really needs. This serum is light and absorbs quickly into the skin. With a few uses, my skin looked smoother and my redness was calmed. I used this product in the morning before applying my makeup and it helped my foundation glide on easier. My skin did, in fact, look dewy and hydrated. I also used this at night and I woke up to perfectly moisturized skin. I was actually comfortable going out in public with little or no face make up (LOVE it!). 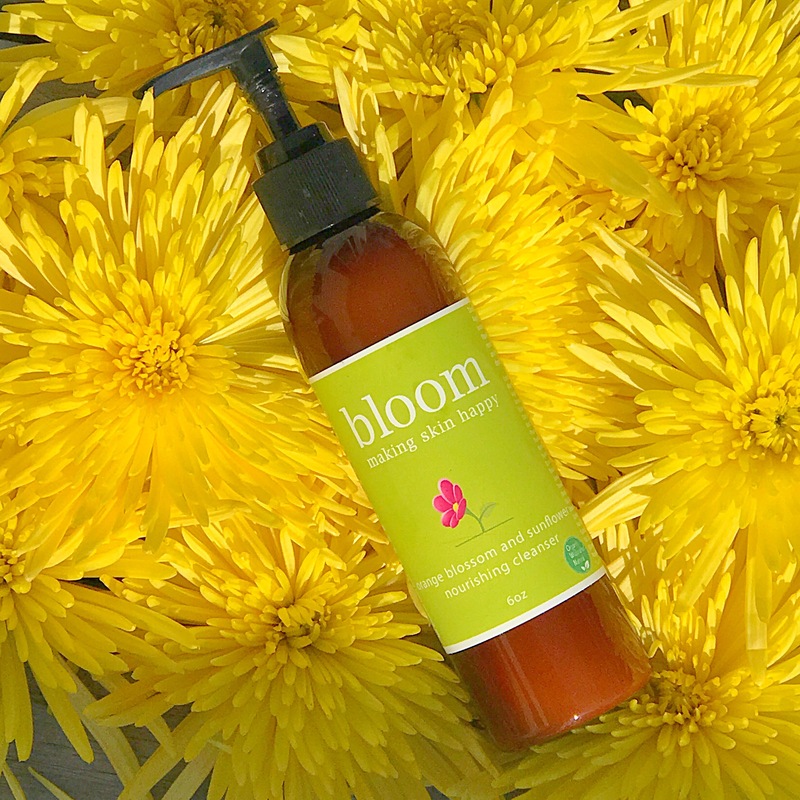 I truly adore companies like Bloom Making Skin Happy. Their products are naturally effective, smell fantastic, and the packaging is as cute as can be! The packaging is made of recycled plastic, the labels are printed with soy ink, and they are a Zero Waste company. How awesome is that? Of course, the products are vegan and cruelty-free and they use only high-quality organic ingredients. 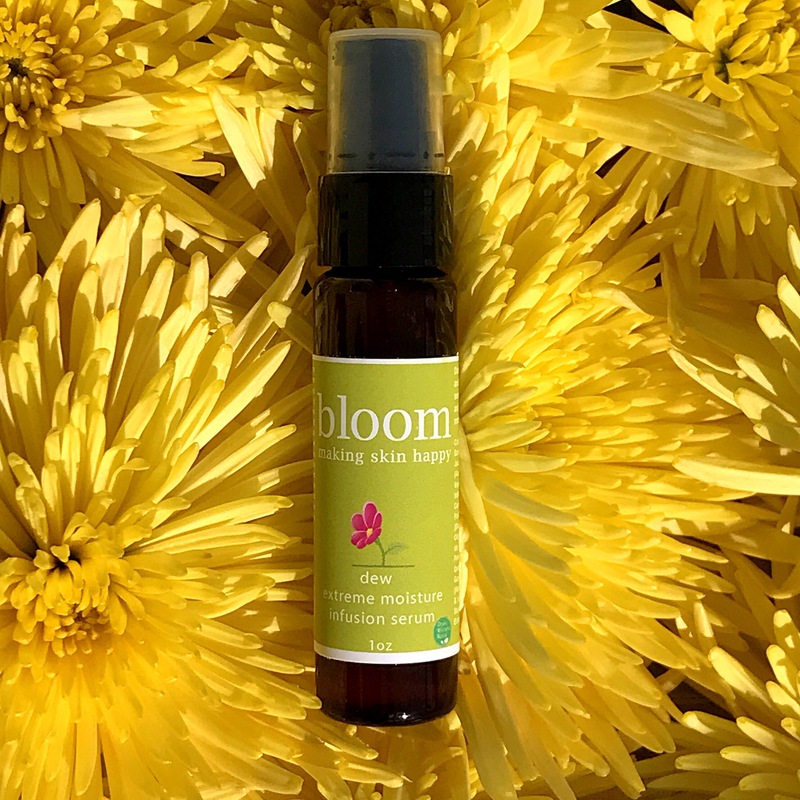 With their fabulous and naturally powerful products, conscientious packaging, and anti-cruelty stance, Bloom is everything a company should be! Please check out their website and let me know what products are your favorite!